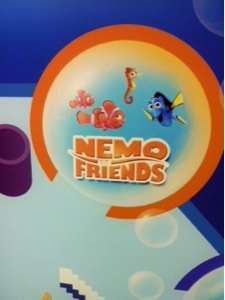 Orlando Visitor: Aquatic Adventures at Seas with Nemo and Friends Pavilion Epcot WDW. Aquatic Adventures at Seas with Nemo and Friends Pavilion Epcot WDW. The Seas with Nemo and Friends Pavilion at Epcot Walt Disney World is a fun, educational, informative aquatic showcase. The aquarium is amazing, lots to see, and catch the Finding Nemo ride which is great for the whole family. The ride is based on the popular Disney Pixar movie Finding Nemo. There is now a sequel movie called Finding Dory for more underwater antics and adventures to enjoy. A Walkway to Tomorrowland, WDW, Florida.